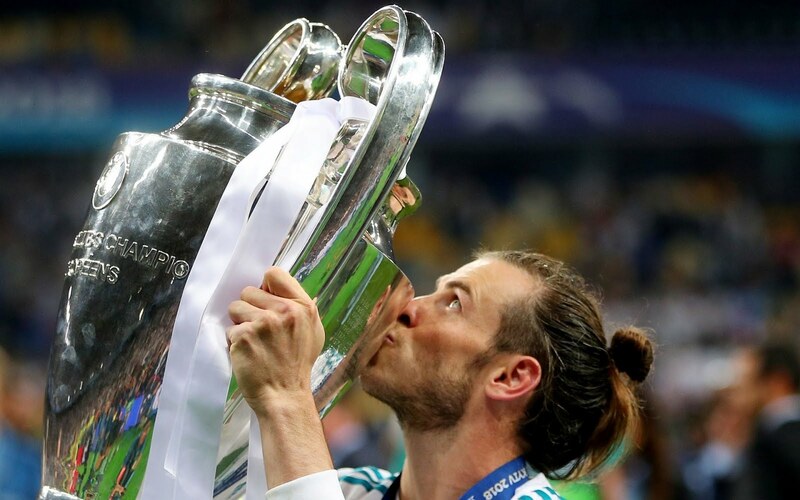 Real Madrid crushed Liverpool hearts as they secured an unprecedented third straight UEFA Champions League title in the Ukranian capital at the hands of two goalkeeper errors and a spectacular finish from Gareth Bale. The Reds suffered a devastating early setback when Mo Salah was forced off after suffering a shoulder injury, and a mind-boggling blunder from Loris Karius handed Benzema the opening goal. 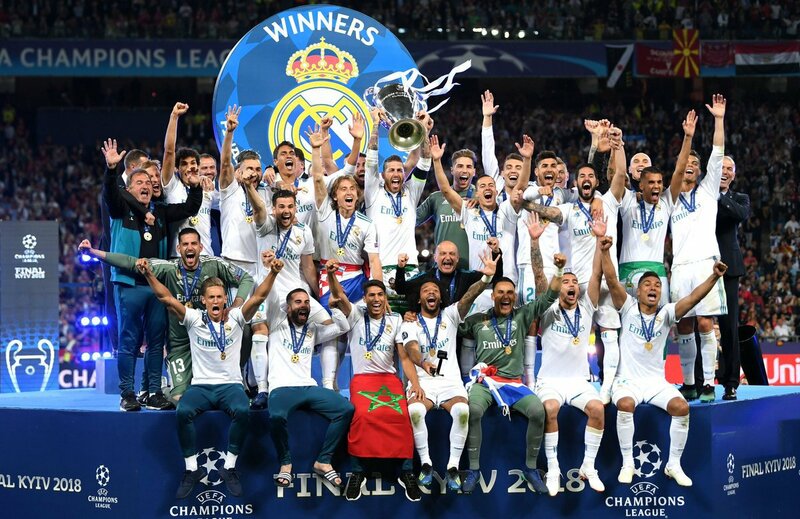 Hope was reignited when Sadio Mane finished off Milner's corner, but a stupendous overhead kick from Gareth Bale, followed by his long-shot being fumbled by Karius, put the final nails in the coffin as Real Madrid once again reigned supreme over the continent. 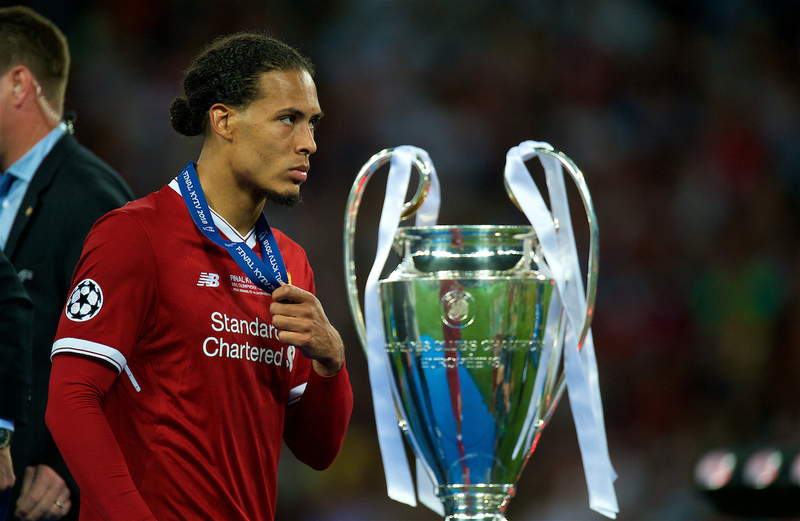 Milorad Mažić's whistle in front of a bouncing Olimpiyskiy National Sports Complex Stadium prompted a high-octane start to the final, with Liverpool showing little fear as they pressed and heckled the back-to-back titleholders. 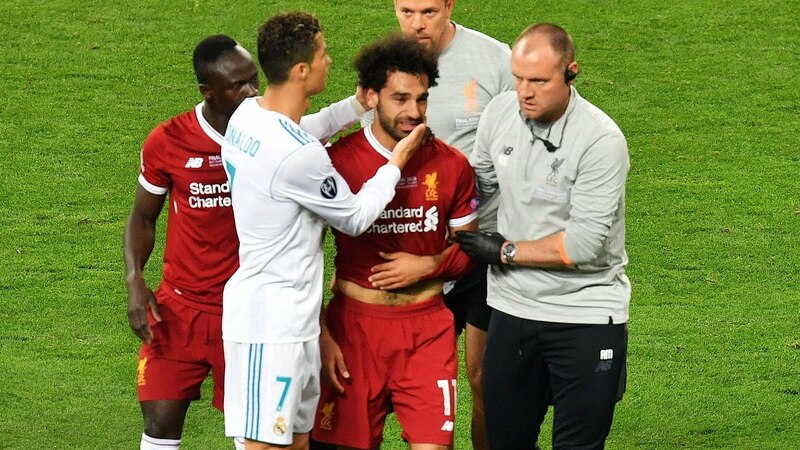 Mohamed Salah gave Los Blancos some early thoughts to worry about, signalling danger on every occasion the Egyptian touched the ball - forcing a foul from Marcelo early on, who would go on to register his side's first shot on goal moments later dragging the attempt wide. Some excellent defending from Dani Carvajal prevented a Liverpool onslaught on the box from developing into anything more than that, with Mane and Salah teasing runs into the area forcing Navas to rush out and deal with the threat. 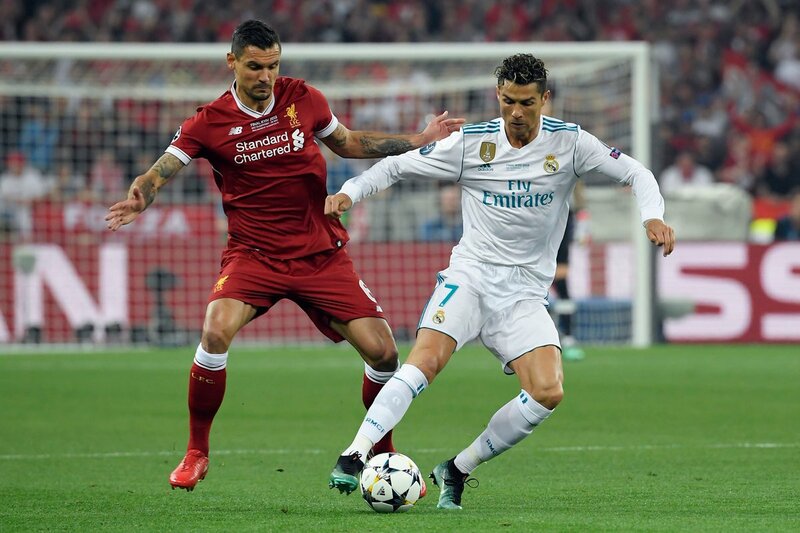 However, all it took was one electric run from Cristiano Ronaldo to remind the Reds of what they had on their hands: on this occasion the Portugese superstar drove it over the crossbar from a tight angle. Roberto Firmino was slow to turn and conjure up a shot towards Navas following a cut-back from Milner, but it almost worked out perfectly as the blocked shot trickled back to Alexander-Arnold who stung a low shot into the hands of the Real keeper. Liverpool continued to pose problems but they would then be dealt a major blow. 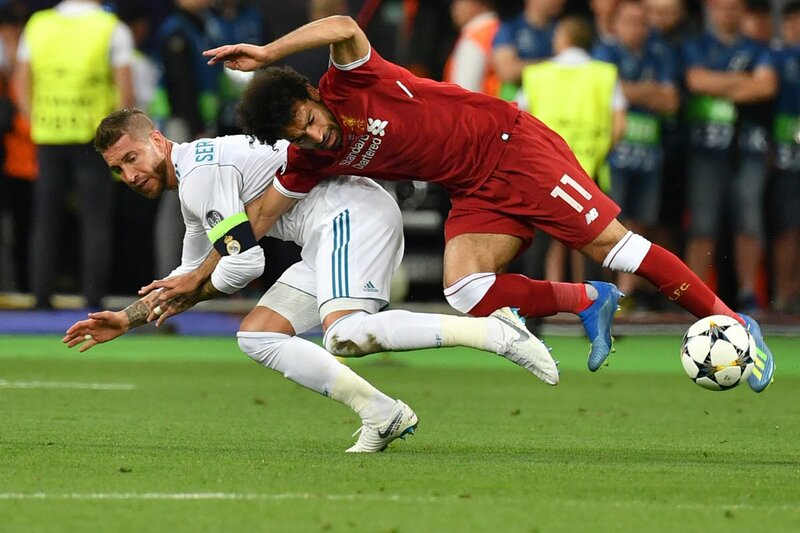 Sergio Ramos and Mohamed Salah both went down in a challenge, with the Spaniard defender injuring Salah's shoulder as the arm got trapped going down. 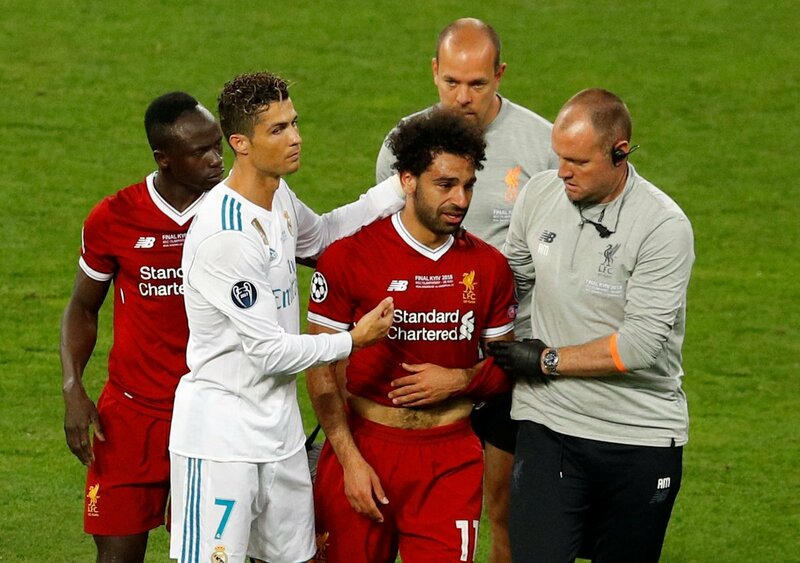 The Egyptian soldiered on to receive treatment and came on to play a few more minutes, but when he was down in tears again, nightmare had struck: Salah was forced out of the Champions League final. Visibly shellshocked, Real Madrid spelt blood as Liverpool attempted to shake the cobwebs. Benzema's shot was blocked but himself and Ronaldo continued to pile numbers into the area. 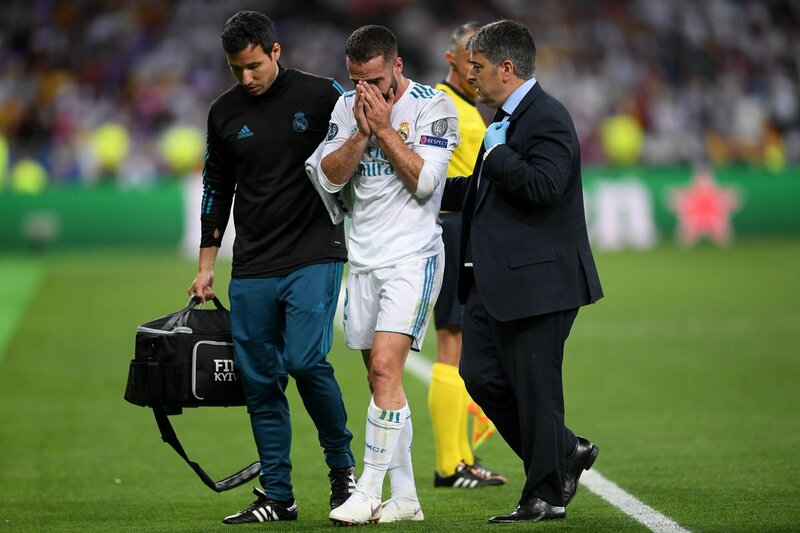 Then, there would be more heartbreak as Dani Carvajal - who picked up a knock in the warm ups - succumbed to his injuries and left the pitch in tears, with Nacho his replacement. 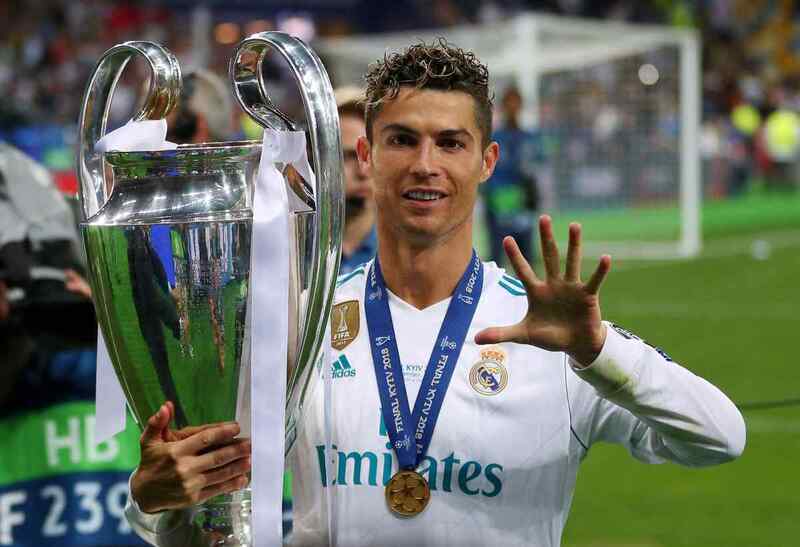 The Madrid fans were soon celebrating as Karim Benzema put it in the back of the net before an offside call, but it would only give more momentum to Real who continued to come forward and really took control of the game. After three minutes of stoppage time the half-time whistle blew and it was goalless. Parched of many chances, with the injuries really being the headline. Liverpool fans were in full voice to begin the second half, in an attempt to will their team towards a sixth European title. But their hearts would soon be racing once again as Isco's effort hit the crossbar after Karius rushed off his line. 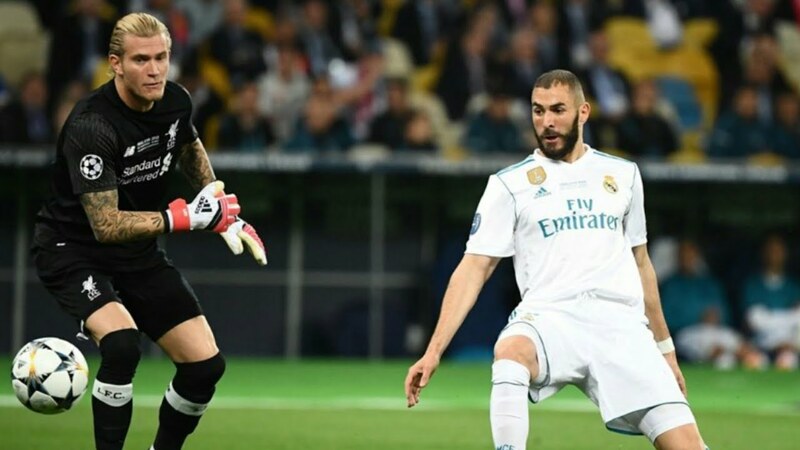 Real Madrid still continued to press forward, and when the attack should have come to an end as Karius picked up the ball on the end of Benzema's run, an absolute mishap would cause turmoil for the English side. The keeper threw the ball out and it came off Benzema's leg and rolled back into goal giving Real Madrid the lead. Liverpool were shaken but they remained defiant. From a Milner's corner, Lovren latched on to the header before Mane leaped and knocked it over the line to tie the game up. The travelling Liverpool supporters were thrust into delirium. The Reds had bounced back. 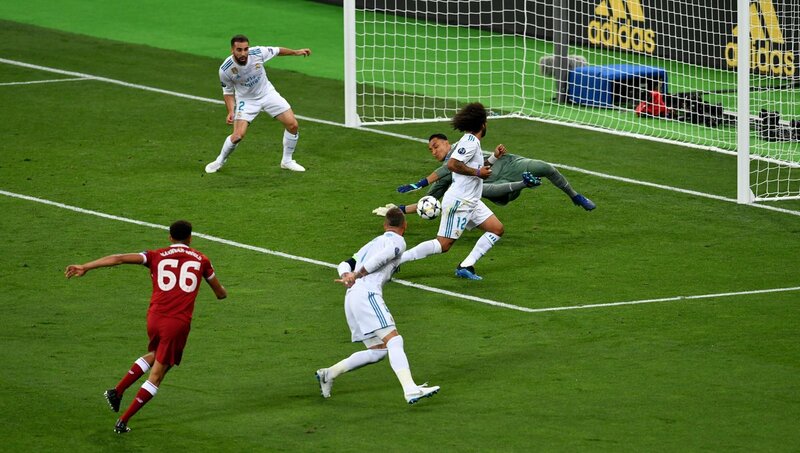 The game was back in the balance for a short period which could have become even more premature had Isco not been denied by an excellent Karius save. There was no stopping what the Reds' keeper would come up against next however. Just after the hour mark, Casemiro picked out Marcelo high up on the left flank, where the defender would whip a relatively high cross towards the penalty area. 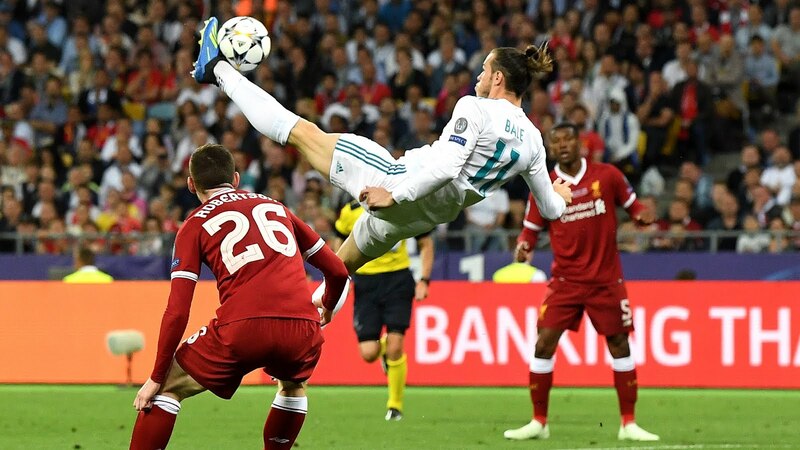 Gareth Bale leaped up and unleashed a thunderous overhead kick which flew into the top corner in one of the greatest Champions League goals to ever be scored. Liverpool were reeling from the gut punch of all gut punches, with time ticking on and their efforts to salvage the came coming up short. 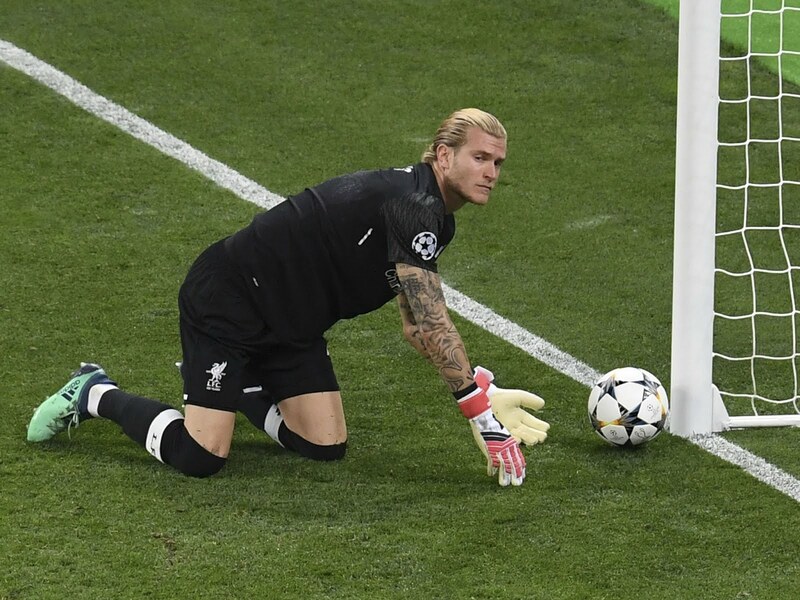 All hope would be eviscerated by another Loris Karius blunder in the 83rd minute which all but handed Real Madrid their third consecutive title. Gareth Bale received the ball from 35 yards and with little pressure on him, he went for the audacious long shot. The ball dipped slightly but it appeared to be a simple save for Karius - however the keeper fumbled it into his own net and the Reds were completely stunned. Possibly thanks to a pitch invader, the scoreline would end at that, as Cristiano Ronaldo encroached the box in the later minutes before the referee stopped play for the hooligan. 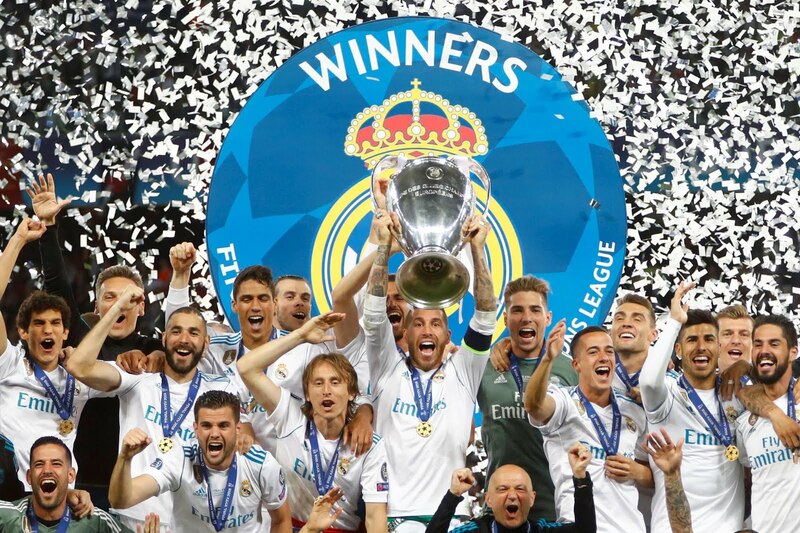 At the full-time whistle, Real Madrid had once again secured their spot as the most supreme team on the continent.